You can use my assets and scripts provided that your product will be free. You can reupload the mod anywhere but on Steam Workshop. Credits to Deathless Aphrodite for the storms, rain and wind sounds and weather interior sounds script. Credits to Morbus for the original Weather Inside mod which Deathless Aphrodite tweaked and I adapted to Fallout. Thanks to Cipscis for finding the way to make functional the Radioactive Rain Plugin. Thanks to eon1000 for doing the fomod package. Thanks to kaburke for adapting the fomod script to the new FOMM version. Thanks to everyone who voted, this mod became the file of the month of May 2009. IT'S IMPOSSIBLE TO MAKE RAIN NOT PASS THROUGH BUILDING, NO, I CAN'T DO ANYTHING ABOUT IT, JUST TO LET YOU KNOW, IT WAS THE SAME IN OBLIVION AND MORROWIND, WHICH WERE BEEN MADE BY BETHESDA ITSELF. 2)Removed any incompatibility by removing all original fallout modifies, now all features are added to the game cleanly, no incompatibilities guaranteed! 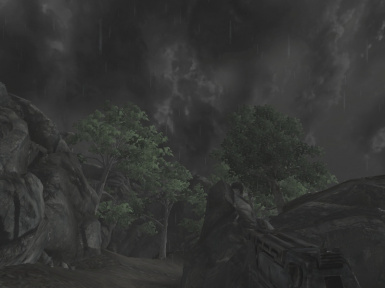 6)Increased number of raindrops to fit the new rain texture. This esm manages rain and snow with scripts, it also contains global variable used by other mods to make rain and some weather sounds, it is needed by other esps, and may be used by other modders to base their work upon this. 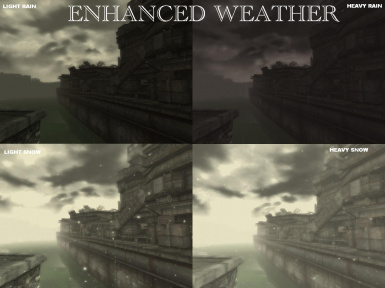 This mod by Gopher adds an item called <REBOOT weather>. When you eat it, you'll hear a loud clap of thunder (just to let you know it's working), and after about 10 seconds the weather should be rebooted and work as normal. This mod makes rain from all mods based on the Enhanced Weather - Rain and Snow.esm radioactive. 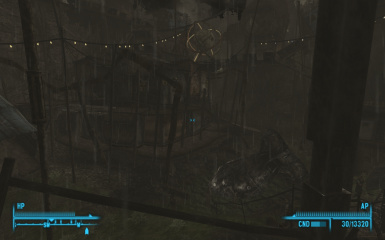 When you first load the game with this mod enabled you will receive the Enhanced Weather Settings item in the Items/Aid section of the PipBoy, by using it you will be able to change four parameters: Min Rain and Snow Duration, Max Rain and Snow Duration, Min Not-Rainy Not-Snowy weather duration and Max Not-Rainy Not-Snowy weather duration; the deafults settings are respectively, 2 hours, 2 days, 4 hours, 4 days. By activating that you will be able to test the rain and the snow too. It works best with Fellout by Hattix. When you load a save where there is rain sounds vanish. If you save during rain with the Radiation Plugin activated, then you disable it and load that savegame, the Geiger counter will stuck on your UI, to fix it you have to enable the radioactive plugin again, wait for rain to start, wait for rain to cease, save, quit and disable the plugin. Although I can't see a way this mod should cause damage to your computer or your game I have to say that the creator declines the responsibility of any damage caused by this mod, and he won't talk with any people that say this mod harmed their game until they have proof.